Some people seem to stumble across exactly the thing they were meant to do and put their whole hearts into it. People change the world that way. Ever heard of Augusta Baker? 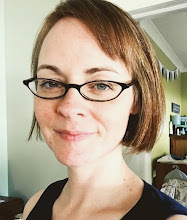 Click her name to read more about who she was and what she did, but my summary of the article is this: Augusta Baker was a woman who ignored boundaries. She was determined and worked hard to make things happen--things that were important to her. Some of her major accomplishments include changing the face of children's publishing by influencing the portrayal of African-Americans in children's books, working as Coordinator of Children's Services at the New York Public Library for nearly 15 years, and working for 15 years as Storyteller-in-Residence at the University of South Carolina. Her life and career were about a love of literature, overcoming odds, and standing for what she believed in. It's one thing to read a biography like that on Wikipedia, or on a blog, or even on the library website. But what truly attests to a person's effect on the world is not an encyclopedic description of her life--it's the witness of those who knew her and the lasting products of her work. On a shelf right now in the vault of the Ernest F. Hollings Special Collections Library lies a box holding the Augusta Baker Retirement Book which is on deposit. Yesterday, I was shown the book in order to begin a research project. The book was given to Baker upon her retirement from NYPL. Inside are thick pages sewn together and bound into what amounts to a huge appreciation letter from writers and illustrators such as Maurice Sendak, Madeleine L'Engle, Virginia Hamilton, John Steptoe, H. A. Rey, Garth Williams, Crockett Johnson, P. L. Travers, and the list goes on. 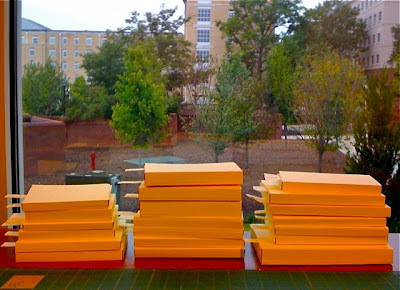 Each page is either a handwritten letter or an original work of art thanking Baker for her work. Harold greets her with his purple crayon, Curious George holds a bouquet of flowers in her honor, one of the Wild Things smiles off the page for her, Frances (sans bread and jam) is as cute as ever--all unique and original pieces. I requested to be left alone in the vault with bread and water alone to sustain me, but of course you can't have things like bread and water around original works of art or irreplaceable unique copies of handwritten letters by award winning authors, so I had to survive with the small glimpse I was given into the life of someone who made a difference. So what's the big deal about books and Baker and Curious George and the rest anyway? Think back to being a kid. You remember them, don't you? The characters...the stories maybe...they've stayed with you and are a part of you, and when you see a picture you haven't seen in 20 or 30 or 60 years of a little ink drawing of a character you loved, you're suddenly back in time, and it matters. And now you're reading the books to your kids, or your grandkids, possibly over and over until you kinda wish the book never existed. But you deserve it--you probably did the very same thing to your poor parents. The rest of my afternoon, though not nearly as glamorous, was very interesting and felt a little like Christmas. In the stacks are shelves and shelves of books, many on the verge of crumbling if handled roughly. If they're hardback, they stand a chance, but paperbacks with any age or having been read at all must be protected in a special way. I learned a step in the process yesterday by doing my first stack of four-folds. 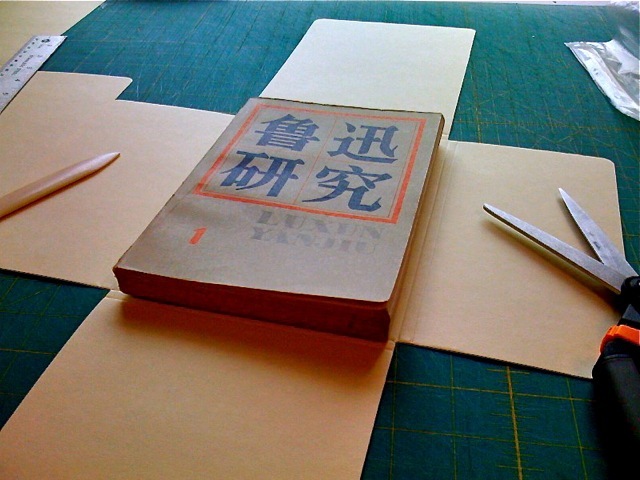 As seen below, a piece of card stock is measured and cut and creased to fit the book. 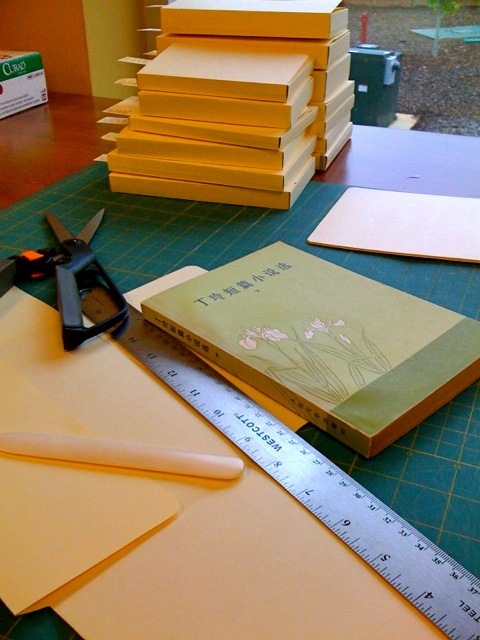 The first step is to place the book on top for making measurements, then the proper cuts are made, then the card stock is wrapped around the book (kind of like wrapping a present, but they're all the easy kind-rectangular and flat like a shirt-box) and attached with strips of velcro so the books can be shelved safely. I did okay for my first day. Got 19 books wrapped and ready to be shelved. If I could have put bows on them, I would have, but that wouldn't be very practical. And if shelving is anything, it's practical.